Metal Samples has selected some commonly used metals for non-destructive testing. 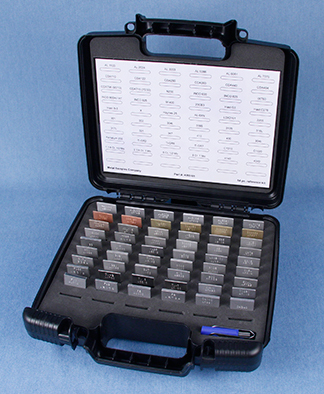 Reference Assortment Kits can be very useful in performing the Chemical Spot Test. This test method is based on electrographic extraction of metal atoms from a surface and can be verified by testing on a known alloy. An additional use of these kits is to check the element content of an alloy by examining the color intensity of a chemical spot in comparison to a standard. The reagent chemicals can be tested on a metal standard to ensure the shelf life of the chemical has not been exceeded. Another non-destructive evaluation that utilizes metal standards is the Thermoelectric Alloy Separators Test. This test measures the "EMF" generated by a heat junction of dissimilar metals. The magnitude of the "EMF" is a function of the metal's chemistry and physical characteristics. Reference Kit No. KR5100 contains 44 different alloys and Reference Kit No. KR5101 contains 54 different alloys. Additional slots are provided with the kit to expand the selection of alloys to meet your specific requirements. The chemical analysis of each alloy in the kit has been tabulated from mill test reports and certified chemical analyses. These test results are recorded on an analysis sheet that accompanies the assortment. Alloy specimen sizes can be either 1" x 2" x 1/16" or 1" x 2" x 1/8". The alloy specimens have a glass bead blasted finish.